User-defined functions are an important feature, because they significantly extend the expressiveness of queries. In most cases, a user-defined function must be registered before it can be used in an query. It is not necessary to register functions for the Scala Table API. Functions are registered at the TableEnvironment by calling a registerFunction() method. When a user-defined function is registered, it is inserted into the function catalog of the TableEnvironment such that the Table API or SQL parser can recognize and properly translate it. Please find detailed examples of how to register and how to call each type of user-defined function (ScalarFunction, TableFunction, and AggregateFunction) in the following sub-sessions. If a required scalar function is not contained in the built-in functions, it is possible to define custom, user-defined scalar functions for both the Table API and SQL. A user-defined scalar functions maps zero, one, or multiple scalar values to a new scalar value. In order to define a scalar function one has to extend the base class ScalarFunction in org.apache.flink.table.functions and implement (one or more) evaluation methods. The behavior of a scalar function is determined by the evaluation method. An evaluation method must be declared publicly and named eval. The parameter types and return type of the evaluation method also determine the parameter and return types of the scalar function. Evaluation methods can also be overloaded by implementing multiple methods named eval. Evaluation methods can also support variable arguments, such as eval(String... strs). By default the result type of an evaluation method is determined by Flink’s type extraction facilities. This is sufficient for basic types or simple POJOs but might be wrong for more complex, custom, or composite types. In these cases TypeInformation of the result type can be manually defined by overriding ScalarFunction#getResultType(). The following example shows an advanced example which takes the internal timestamp representation and also returns the internal timestamp representation as a long value. By overriding ScalarFunction#getResultType() we define that the returned long value should be interpreted as a Types.TIMESTAMP by the code generation. Similar to a user-defined scalar function, a user-defined table function takes zero, one, or multiple scalar values as input parameters. However in contrast to a scalar function, it can return an arbitrary number of rows as output instead of a single value. The returned rows may consist of one or more columns. In order to define a table function one has to extend the base class TableFunction in org.apache.flink.table.functions and implement (one or more) evaluation methods. The behavior of a table function is determined by its evaluation methods. An evaluation method must be declared public and named eval. The TableFunction can be overloaded by implementing multiple methods named eval. The parameter types of the evaluation methods determine all valid parameters of the table function. Evaluation methods can also support variable arguments, such as eval(String... strs). The type of the returned table is determined by the generic type of TableFunction. Evaluation methods emit output rows using the protected collect(T) method. In the Table API, a table function is used with .join(Table) or .leftOuterJoin(Table). The join operator (cross) joins each row from the outer table (table on the left of the operator) with all rows produced by the table-valued function (which is on the right side of the operator). The leftOuterJoin operator joins each row from the outer table (table on the left of the operator) with all rows produced by the table-valued function (which is on the right side of the operator) and preserves outer rows for which the table function returns an empty table. In SQL use LATERAL TABLE(<TableFunction>) with CROSS JOIN and LEFT JOIN with an ON TRUE join condition (see examples below). // The generic type "Tuple2<String, Integer>" determines the schema of the returned table as (String, Integer). // Use the table function in the Java Table API. "as" specifies the field names of the table. // Use the table function in SQL with LATERAL and TABLE keywords. // CROSS JOIN a table function (equivalent to "join" in Table API). // LEFT JOIN a table function (equivalent to "leftOuterJoin" in Table API). // The generic type "(String, Int)" determines the schema of the returned table as (String, Integer). // use collect(...) to emit a row. // Use the table function in the Scala Table API (Note: No registration required in Scala Table API). // "as" specifies the field names of the generated table. // Register the table function to use it in SQL queries. IMPORTANT: Do not implement TableFunction as a Scala object. Scala object is a singleton and will cause concurrency issues. Please note that POJO types do not have a deterministic field order. Therefore, you cannot rename the fields of POJO returned by a table function using AS. By default the result type of a TableFunction is determined by Flink’s automatic type extraction facilities. This works well for basic types and simple POJOs but might be wrong for more complex, custom, or composite types. In such a case, the type of the result can be manually specified by overriding TableFunction#getResultType() which returns its TypeInformation. The following example shows an example of a TableFunction that returns a Row type which requires explicit type information. We define that the returned table type should be RowTypeInfo(String, Integer) by overriding TableFunction#getResultType(). 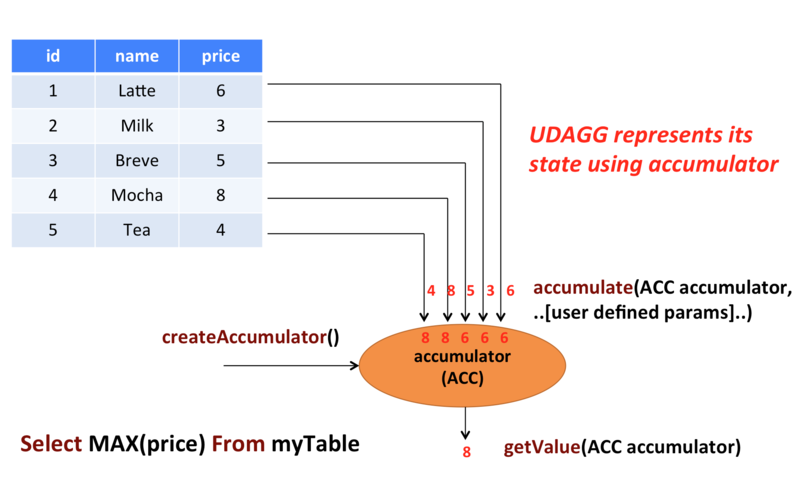 User-Defined Aggregate Functions (UDAGGs) aggregate a table (one ore more rows with one or more attributes) to a scalar value. The above figure shows an example of an aggregation. Assume you have a table that contains data about beverages. The table consists of three columns, id, name and price and 5 rows. Imagine you need to find the highest price of all beverages in the table, i.e., perform a max() aggregation. You would need to check each of the 5 rows and the result would be a single numeric value. User-defined aggregation functions are implemented by extending the AggregateFunction class. An AggregateFunction works as follows. First, it needs an accumulator, which is the data structure that holds the intermediate result of the aggregation. An empty accumulator is created by calling the createAccumulator() method of the AggregateFunction. Subsequently, the accumulate() method of the function is called for each input row to update the accumulator. Once all rows have been processed, the getValue() method of the function is called to compute and return the final result. Flink’s type extraction facilities can fail to identify complex data types, e.g., if they are not basic types or simple POJOs. So similar to ScalarFunction and TableFunction, AggregateFunction provides methods to specify the TypeInformation of the result type (through AggregateFunction#getResultType()) and the type of the accumulator (through AggregateFunction#getAccumulatorType()). Besides the above methods, there are a few contracted methods that can be optionally implemented. While some of these methods allow the system more efficient query execution, others are mandatory for certain use cases. For instance, the merge() method is mandatory if the aggregation function should be applied in the context of a session group window (the accumulators of two session windows need to be joined when a row is observed that “connects” them). retract() is required for aggregations on bounded OVER windows. merge() is required for many batch aggregations and session window aggregations. resetAccumulator() is required for many batch aggregations. All methods of AggregateFunction must be declared as public, not static and named exactly as the names mentioned above. The methods createAccumulator, getValue, getResultType, and getAccumulatorType are defined in the AggregateFunction abstract class, while others are contracted methods. In order to define a aggregate function, one has to extend the base class org.apache.flink.table.functions.AggregateFunction and implement one (or more) accumulate methods. The method accumulate can be overloaded with different parameter types and supports variable arguments. Detailed documentation for all methods of AggregateFunction is given below. * Base class for aggregation functions. *             aggregated values which are needed to compute an aggregation result. *             AggregateFunction must be put into the accumulator. * Creates and init the Accumulator for this [[AggregateFunction]]. * requires at least one accumulate() method. * @param [user defined inputs] the input value (usually obtained from a new arrived data). * datastream bounded over aggregate. * implemented for datastream session window grouping aggregate and dataset grouping aggregate. * Called every time when an aggregation result should be materialized. * Returns true if this AggregateFunction can only be applied in an OVER window. * @return true if the AggregateFunction requires an OVER window, false otherwise. * Returns the TypeInformation of the AggregateFunction's result. *         should be automatically inferred. * Returns the TypeInformation of the AggregateFunction's accumulator. *         accumulator type should be automatically inferred. use the function in a query. To calculate an weighted average value, the accumulator needs to store the weighted sum and count of all the data that has been accumulated. In our example we define a class WeightedAvgAccum to be the accumulator. Accumulators are automatically backup-ed by Flink’s checkpointing mechanism and restored in case of a failure to ensure exactly-once semantics. The accumulate() method of our WeightedAvg AggregateFunction has three inputs. The first one is the WeightedAvgAccum accumulator, the other two are user-defined inputs: input value ivalue and weight of the input iweight. Although the retract(), merge(), and resetAccumulator() methods are not mandatory for most aggregation types, we provide them below as examples. Please note that we used Java primitive types and defined getResultType() and getAccumulatorType() methods in the Scala example because Flink type extraction does not work very well for Scala types. * Weighted Average user-defined aggregate function. val tEnv: StreamTableEnvironment = ??? The Table API and SQL code generation internally tries to work with primitive values as much as possible. A user-defined function can introduce much overhead through object creation, casting, and (un)boxing. Therefore, it is highly recommended to declare parameters and result types as primitive types instead of their boxed classes. Types.DATE and Types.TIME can also be represented as int. Types.TIMESTAMP can be represented as long. We recommended that user-defined functions should be written by Java instead of Scala as Scala types pose a challenge for Flink’s type extractor. Sometimes it might be necessary for a user-defined function to get global runtime information or do some setup/clean-up work before the actual work. User-defined functions provide open() and close() methods that can be overridden and provide similar functionality as the methods in RichFunction of DataSet or DataStream API. The open() method is called once before the evaluation method. The close() method after the last call to the evaluation method. The open() method provides a FunctionContext that contains information about the context in which user-defined functions are executed, such as the metric group, the distributed cache files, or the global job parameters. getMetricGroup() Metric group for this parallel subtask. getCachedFile(name) Local temporary file copy of a distributed cache file. getJobParameter(name, defaultValue) Global job parameter value associated with given key.